While tomatoes, peppers and a handful of herbs have always filled my yard during the summers, 2018 was the first year I spent specifically growing flowers. I am fascinated with landscape design and was very interested in incorporating cutting flowers into my yard’s existing landscape. 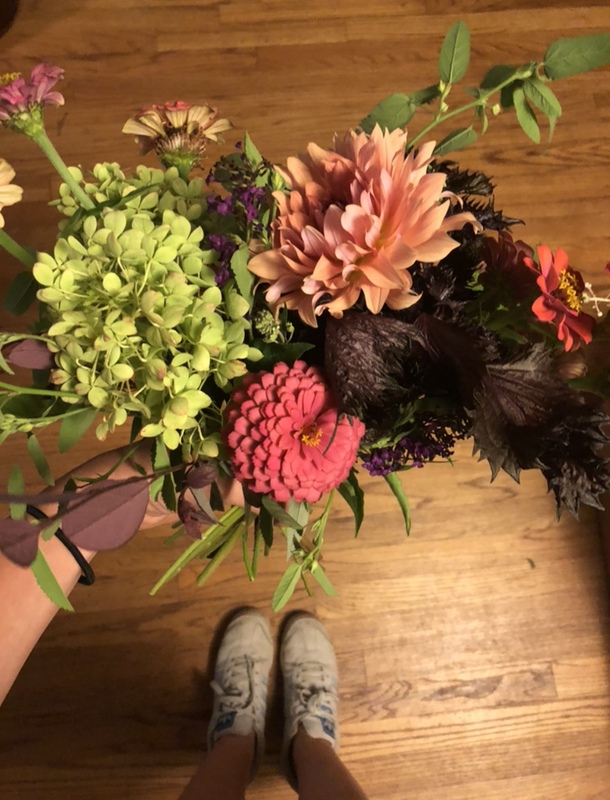 I knew at the time I didn’t have the space or the time to seriously grow flowers for use in wedding floral design work (plus I had no idea what I was doing), but I figured it would be convenient to have a few flowers available if I ever needed them. I deemed 2018 my trial year for flower growing. In the fall of 2017, I planted bulbs for ranunculus, anemone and tulips. I built a small, 4’x8’ raised bed in the backyard for the ranunculus and anemone where I knew they would get full sun, and then kind of just planted tulips anywhere I thought they would look nice around the house. I also invested in a small heat mat and growing lights to try and start a few other seeds indoors. At the time, I felt a whole lot more confident about the success of my seedlings indoors opposed to all of the bulbs outside. We had a surprise early snow during the first week of December that I thought for sure would kill all of my little anemone and ranunculus sprouts. I vividly remember running around like a madwoman trying to cover them all up while it was snowing, cursing myself for procrastinating buying a roll of landscape fabric to keep them covered through the winter. I felt that surely my seedlings indoor had a much better chance at survival since I would have full control over them, but as it turns out, mother nature has been at the growing game for just a bit longer than I have. Nearly all of the bulbs I planted outdoors the first time around were successful. I was even able to use some of my ranunculus and anemone for some early spring events. Between working full time and trying to get my own little business off the ground, I just didn’t have the time and energy to devote to starting a bounty of seeds indoors like I had planned. I did end up being able to directly sow a few seeds outdoors for the summer. My zinnias did wonderfully, my cosmos did okay and my scabiosa seeds didn’t do anything at all. My most anticipated flowers to grow were dahlias. They have been successful for the most part, but I learned the hard way that I will definitely need a stronger support system for the showy blooms next year, as I had to carefully pick the plants up several times and hope they wouldn’t fall over again. They did survive the after effects from two hurricanes though (Florence and Michael) and are still blooming at the present moment. A quick photo snapped of a July birthday bouquet for a friend from the garden - a hydrangea, dahlia, several zinnias, shiso and a few snips from my butterfly bush. Outside of what I intentionally planted for the 2018 year, I’ve also been quite fortunate to have discovered several flowers in the yard growing without my help. My home was built in the 1950’s, and the yard was once home to what was surely a quite bountiful garden. Over the years, several corners of the yard slowly became covered with English ivy, and I knew it would only get worse over time. If you haven’t dealt with an overgrown case of English ivy before, you aren’t missing out. It grows like ropes underground and can take over a yard real quick. Ours wasn’t pretty and was taking over some bushes, so I told myself in the summer of 2017 that I was going to get it all out in one weekend so I could start adding things – like a cutting garden – in over time. I spent almost an entire Saturday pulling ivy from one corner of our yard, around our fig tree. At the end of the day, I was exhausted, had a huge unidentified bug bite and had only removed about 1/20th of the ivy in the yard. I spent a LOT of afternoons and weekends chipping away at it and eventually called it quits for the year. I was beyond frustrated and felt really discouraged for spending so much time to not finish the entire job. Fast forward to early spring 2018: Nearly fifty daffodils popped up that had been planted decades before! Their bulbs had been covered by the ivy for years, just patiently to bloom again. The daffodils were in full swing right when the camellias and anemone were blooming. I imagine it was probably the most poetic outcome of grueling yard work that I will ever experience. We also had a handful of tulips sprout up from where ivy or other plants had been. Such fun surprises! They all grew much taller than the tulips I had planted, most in pretty, light shades of pink. Later in the season, I discovered 5-6 rogue allium flowers growing where tulips had been, timed perfectly so that I could incorporate them with colorful wedding on Paris Mountain during the first weekend of June. Along with the daffodils and tulips, I’ve also been able to find a couple of lunaria plants, shiso, a few bright purple Lilies and at the moment a quite bountiful pumpkin vine. As corny as it may sound, there is seriously nothing that brightens my day as much as discovering something new in my own yard. As the leaves are beginning to change and temperatures are drop, fall has become a very bittersweet time for me. I will so miss having my little cutting garden outside, but I am already incredibly excited for what’s in store for my spring garden. Until then! The new website has been in the works for quite some time, and I'm so excited to finally share it. Stay tuned for future blog posts on all things flowers and upcoming Hudson Stems events. In the meantime, I would love to hear your feedback on the new site! As always, feel free to get in touch via email or through social media.